Dedicated to the memory of Ray Wilson. 14th November 2018: More modules complete, including NLC Bindubba 3 polydirectional sequencer, 8 Bit Cipher, Delay No More dual PT2399 audio mangler, and Jurgen Haible Schulte phasers. Also complete overhaul of the main sequencer, with new MFOS control added to the old CGS gate/CV sequencer. Clouds and Elements by Mutable Instruments build details here. 19th September 2018: Woodwork now complete on third set of cabinets, and panels done for 20 no. Thomas Henry X-4046 VCOs. About 10 of the VCOs still need wiring, and all of them need calibrating, which is going to take ages. 5th January 2017: Geiger counter module complete. Produces random voltages by comparing the time between clicks. Initially counts three clicks, then takes the time between 1 and 3 as the overall range mapped to 5V, and click 2 as the voltage level. It then waits for the next click to replace click 3, and re-assigns the previous 2 and 3 to the new 1 and 2, if that makes sense. The 5V is converted into a control voltage signal, with adjustable range and offset, adapted from Ken Stone's joystick schematic. Glide has also been borrowed from a CGS module. Also produces a trigger output every time the geiger counter is activated. The text below was written around 2011, is totally out of date, and will be deleted before long. I need to rewrite this and mention NLC, SynthCube and amazingsynth.com - great sources of PCBs. This project started in earnest around February 2008, after a bit of planning and research. Earlier this year I helped a friend start building their own synthesiser, and thought it might be useful to document some of the discussions we had. This page will contain some of the things I found out over the last few years, in the hope that they might be of use to someone starting a similar project, without boring anyone to death. 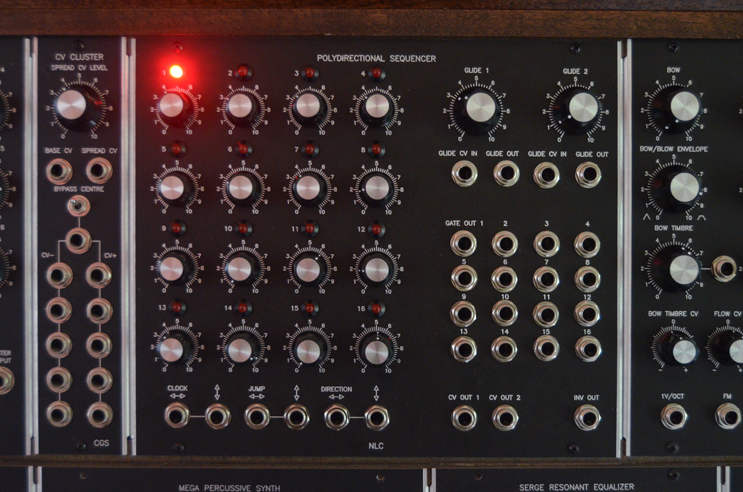 A modular synthesiser, as the name implies, is a synthesiser that consists of various modules, each with an ability to generate or manipulate an audio signal in a specific way. Rather than relying on presets, as with most electronic keyboards, the user can link various modules together to build a sound from first principles. Different aspects of a sound (pitch, volume, timbre, vibrato, reverb etc.) can be controlled entirely independently, allowing for an immense number of sonic possibilities. The modules are linked together using 'patch cables', and a particular arrangement of cables is usually referred to as a 'patch'. This method of generating/organising sounds began (commercially) in the 1960s, and has survived due a number of advantages not present in modern systems. 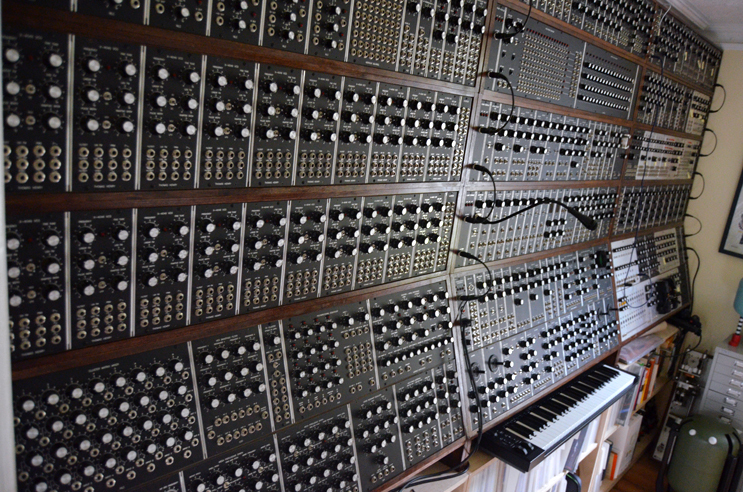 Modulars can seem a little intimidating at first glance, appearing closer to a spaceship control panel than a musical instrument. Once you absorb the concept of connecting modules together, I'm sure you'll quickly realise that it's actually a very intuitive interface that's a lot of fun to use. A lot of modern electronic equipment involves sequentially navigating different 'modes' and choosing options along the way. 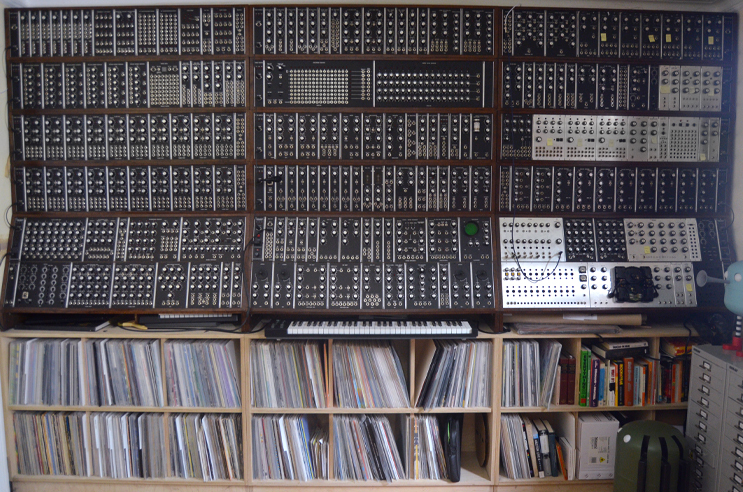 A modular synthesiser physically shows all of these 'modes' simultaneously, with the navigation and choices done via the path of the cables and settings of the knobs and switches. A huge advantage of this method is being able to instantaneously manipulate any parameter without having to fiddle about with a convoluted hierarchy of sub-menus. As well as audio signals, a system called 'control voltage' is used to connect and control various modules. Parameters that can be altered by turning a knob can often be manipulated using a control voltage input. For example, oscillator pitch, filter frequency, volume level etc. can all be altered by connecting something to the 'CV in' socket. Some examples of CV sources include: keyboards, sequencers, LFOs, envelope generators, ribbon controllers, joysticks, pitch bend wheels, foot pedals, theremins, light/temperature/humidity sensors, batteries etc. - anything that produces a voltage in the suitable range (usually around 0 to 10V). A very common example of CV control would be connecting a keyboard to an oscillator to control the pitch. Depending on the key pressed, a different voltage will be sent to the CV input of the oscillator, causing it to change its frequency. Another control mechanism used in analogue synthesisers is a 'gate' signal. This is an on/off signal rather than variable as with CV. Gate signals let a module know that an event is occurring, and how long that event is occurring for. A keyboard sends a gate signal for the length of time that a key is held, allowing a connected module to help something happen during that time. A common use is to activate an envelope generator, which in turn can effect how the volume, filter, LFO amount etc. is applied while the note is held. Finally there are 'trigger' signals, which are similar to gate signals only much shorter. They are typically a very short pulse that lets a module know that an event should be 'triggered', but, unlike gate signals, doesn't describe the length of the event. Typical applications may include sequencer start, stop or 'clock' signals, or control of drum modules. Sometimes the level of the trigger pulse can be varied, e.g. to vary drum accents. 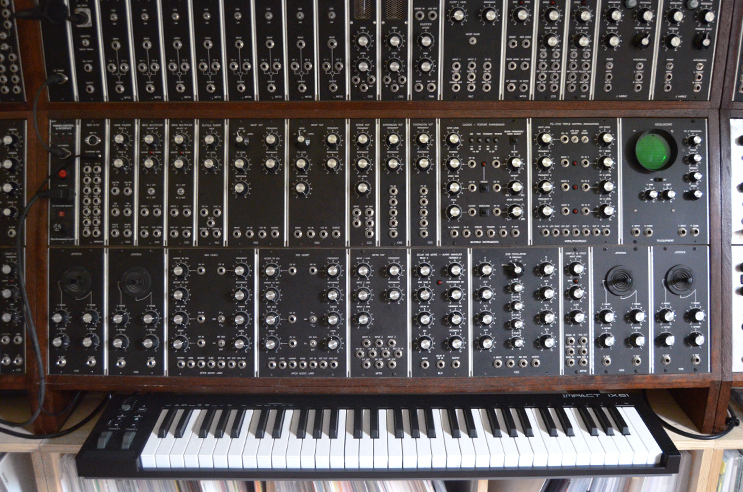 Different synthesiser manufacturers use slight variations of voltage response and levels within the signal systems described above, but the basic concepts remain the same. The introduction of MIDI in the early 1980s increased compatibility between equipment, but perhaps at a cost of reduced flexibility. VCO: A Voltage Controlled Oscillator, if oscillating between 20 to 20,000Hz, produces an audible tone when connected to headphones or a speaker system. A synthesiser VCO usually produces a range of simple waveforms, e.g. sine, triangle, saw and pulse, each of which have their own distinctive basic sound. The frequency (and therefore pitch) of the VCO can be controlled by a large number of control voltage sources, to produce melodies, tones or sound effects. VCF: A Voltage Controlled Filter alters a sound by varying different frequencies allowed to pass through the module, often creating an interesting 'sweeping' property to the processed sound. The VCF is certainly the component that gives a synthesiser the most amount of character. Examples of popular classic filters include the MiniMoog, Roland TB-303, Korg MS-20 etc. VCA: A Voltage Controlled Amplifier can be used to control the level of an audio or CV signal. It can be used to control the volume of a sound, or it can be used in between an LFO and a VCO to determine the amount of effect that the LFO has on the VCO. LFO: A Low Frequency Oscillator is typically used as a CV source that can modulate other modules, creating tremolo or vibrato effects, cyclically manipulating an effect over time. Envelope generator: Generates a transient control voltage pulse, usually split into four sections: Attack, Decay, Sustain and Release (often abbreviated to ADSR). The time of each of these parameters can be set, and the CV output connected to a VCO, filter, VCA etc, so that the effect of the module connected can be 'shaped' when the envelope generator is activated by a gate or trigger signal. Percussive sounds will have a fast volume 'attack', whereas a flute-like sound would have a slower attack. Sequencer: A device for outputting a series of triggers, gates and control voltages, at a certain speed, for controlling triggers, gates and CV parameters in sequence. Uses include creating drum patterns or musical melodies. Noise source: A noise source generates a random signal 'hiss', comparable to the sound of 'static' from a de-tuned radio. A useful building block for snare drum emulation or wind sound effects etc. Sample and hold: Nothing to do with sampling in the sense of digital recording. A sample and hold module will take a signal (often a noise source), examine it at a specific rate (perhaps set by an LFO), and then 'remember', and output, the level of the signal until the next instruction to take a sample. Inputs including a noise source and a clock rate of 1Hz will create a CV output of random frequencies which could, for example, be connected to a VCO to create random pitches every second. Good for 1960s sci-fi computer sounds. Sub oscillator: Divides the frequency of another oscillator into lower octaves, often played simultaneously to 'fatten up' a sound. Ring modulator: Takes a signal and combines it with a second 'carrier' signal (usually a VCO) to create a distinctive metallic/robotic sound. Some for sale here! Vocoder: Usually takes speech as an input, filters it into different frequency bands, then recreates the vocal components electronically to make you sound like a very funky robot. 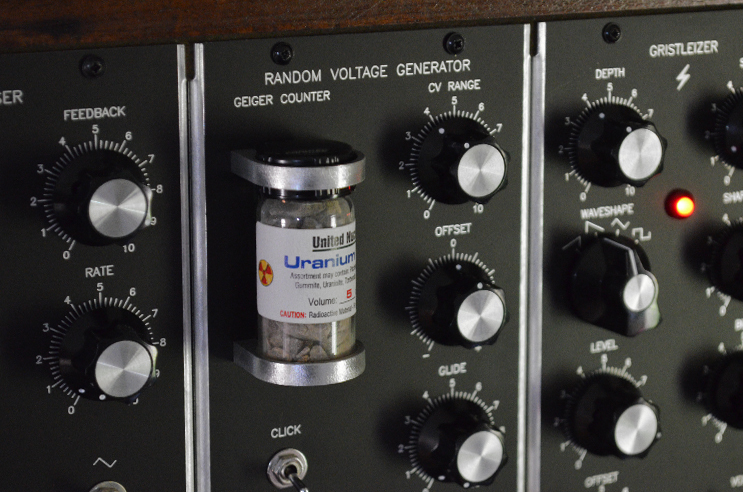 Voltage quantiser: Can be used to take a CV output from a VCO, sequencer etc. and round it off to the nearest semitone. Useful for programming melodies into analogue sequencers. Does every knob do something? Where did you find / buy it? Did you know I have an iPhone app that does the same thing? That does have the advantage of being portable, but there is a nice element of unpredictability with analogue synthesisers that is hard to recreate digitally. I also like the immediacy of the interface, being able to see all the knobs in front of you for easy tweaking of sounds. It's also satisfying to make your own electronic equipment, and it gives an added dimension of appreciation when listening to electronic music, or indeed any music. Can it communicate with aliens? A few people have asked that. I'm not entirely sure yet. Music From Outer Space: Ray Wilson's site, selling blank ("unpopulated") PCBs (Printed Circuit Boards). Excellent range of basic utility modules, e.g. VCO, VCA, LFO, VCF, as well as a great phaser, digital ring modulator etc. Highly recommended for beginners, as site is friendly (if a little hard to navigate), and documentation is extensive. CGS: Ken Stone's site - click on the "PCBs for sale" link for a long list of unusual and interesting modules. The construction notes are good, but more of a guide than a step by step building method, as there may be different ways of implementing the PCB depending on your requirements. Definitely my favourite synth DIY website - contains some really unique and brilliant projects. 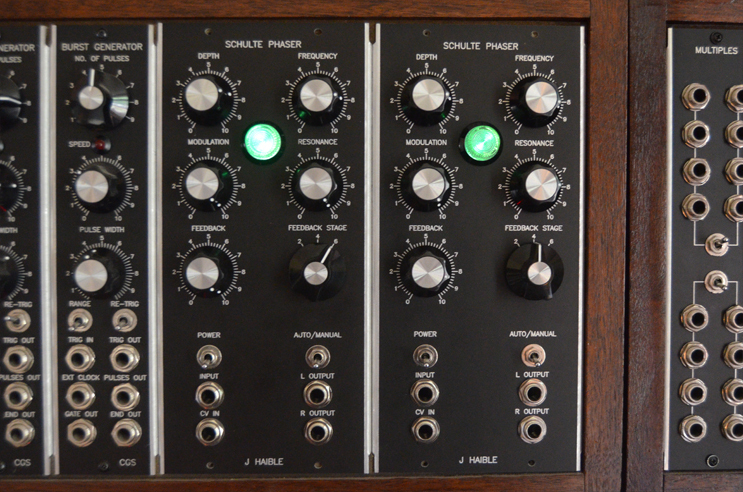 Synthesizers.com: Very high quality pre-assembled modules. Company sometimes referred to as "dotcom". Good source of technical information and +/- 15V power supplies. I have only listed sites that I have dealt with directly - obviously there are plenty more! MFOS and CGS are the ones I have used the most. Components: I am based in the UK, and so use Rapid Electronics for about 90% of electronic components, although there is also RS, Mouser or eBay. Stay away from Maplin, because they are expensive and rubbish. Knobs: I have found a factory in Taiwan - minimum order tends to be 500 or 1000, but with vast savings. Timber for cabinets: SL Hardwoods Ltd, although I don't know if they're necessarily the cheapest. They were a bit grumpy on the phone, as apparently unlike most of their customers I wasn't buying enough timber to construct a galleon or a new wooden fence around London.